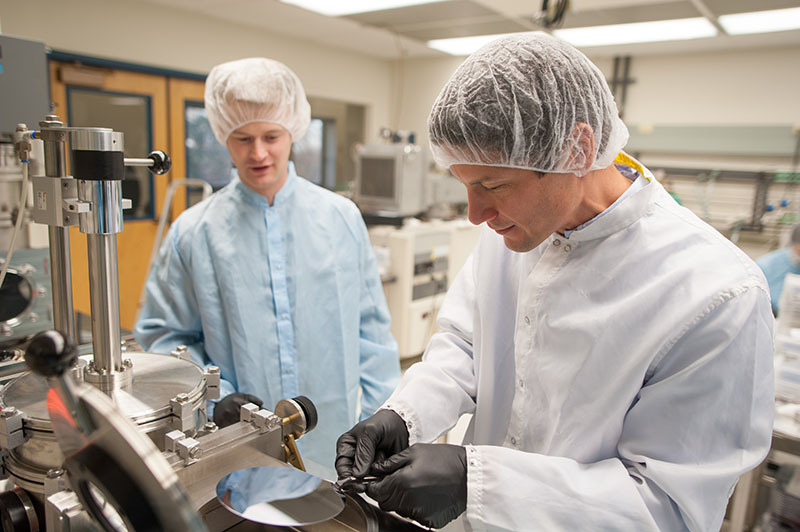 Professor John Conley and Ph.D. student Dustin Austin use a technique called atomic layer deposition (ALD) to synthesize a nanolaminate dielectric film. John F. Conley, Jr., professor of electrical engineering at Oregon State, has been named the only 2015 IEEE Fellow in Oregon. He is being recognized for “contributions to semiconductor process technology to improve radiation hardening of MOS devices,” according to the IEEE awards committee. Conley’s work has had direct impact on earth orbiting satellites, military applications, and the robotic exploration of deep space, as well as the reliability and lifetime of everyday electronic devices. “I have been a member of IEEE since I was a student at Penn State and I feel greatly honored and humbled to have achieved this level of distinction within this organization,” Conley said. One of Conley’s key contributions to improve the radiation hardening of CMOS devices was to the understanding of the reactions between hydrogen and radiation damage centers in MOS devices (with Patrick Lenahan). Another was the first experimental confirmation of the Lelis Model for switching (border) traps (with Lenahan, Aivars Lelis, and Tim Oldham). This work provided fundamental insight into the way in which oxygen vacancy defects, the most important oxide traps, change structure and electronic properties in response to charge capture. Although this work dealt specifically with radiation damage problems near Si/SiO2 interface, the experimentally demonstrated Lelis model now forms the basis for understanding of the negative bias temperature instability (NBTI) — one of the most important MOS reliability problems. Conley has also made significant contributions to the atomic layer deposition (ALD) of dielectrics and nanotechnology (the selective growth of nanowires). His research group at Oregon State is focused on materials development using ALD, metal/insulator/metal devices, internal photoemission, and thin film transistors. Conley’s career includes positions at Dynamics Research Corporation, the Jet Propulsion Laboratory (JPL), and Sharp Laboratories of America (SLA). Since 2007 he has been at Oregon State where he is a professor in the School of Electrical Engineering and Computer Science, and the Intercollege Materials Science Program. He is an ONAMI Signature Faculty Fellow, and co-director of the Materials Synthesis and Characterization (MASC) facility. Conley has authored or co-authored over 120 technical papers, over 130 additional conference presentations (including tutorial short courses on high-k dielectrics and 15 invited talks), and 20 U.S. patents.